A nearly empty parking lot at the intersection of Hamilton Avenue and Route 129 in Trenton sits surrounded by abandoned buildings – massive, at the very least a block in length, three or four stories tall, all made of cracking red brick. On the bottom floor, the city has boarded the windows and padlocked the doors to keep people out. But stories up, through the many broken windowpanes whose metal gridding methodically marches down the length of each wall, something green beckons: a tree has managed to grow within the decaying structure. These buildings form a crucial piece of Trenton’s heavy history. They are a section of the once bustling, successful Roebling Wire Rope Factory. Wire and pottery factories boomed in Trenton in the 1800s, creating a thriving, unionized working class and inspiring the city’s famous slogan, “Trenton Makes, the World Takes.” When heavy industry moved out of Trenton about a century later, large numbers of workers lost their jobs. The situation worsened as race riots erupted in the 1960s. Residents fled, leaving countless homes as well as factory buildings totally deserted. This block of the Roebling factory complex has stood vacant for 20 years and neglected for nearly 50, even though it stands next to a train station, seconds from the Sun Center multipurpose events complex, and a five-minute drive from the State House. But near one of the factory gates, there’s a sign that looks incongruously new: “Environmental investigation and cleanup in progress at this site.” Signs like these are placed on derelict buildings when planners seek to redevelop an area. Trenton hasn’t entirely forgotten the Roebling Factory; something new is happening on this block. John Hatch stands out in Trenton. He drives an electric Cadillac and works in the architectural firm Clarke Caton Hintz, a company housed in an industrial-chic, steel-trussed office space. Its glass-walled conference rooms flooded with natural light would seem more at home in New York City’s Meatpacking District than in the recently-abandoned Masonic Temple building in the heart of Trenton. Hatch is a partner at Clarke Caton Hintz as well as at the development company HHG Development. 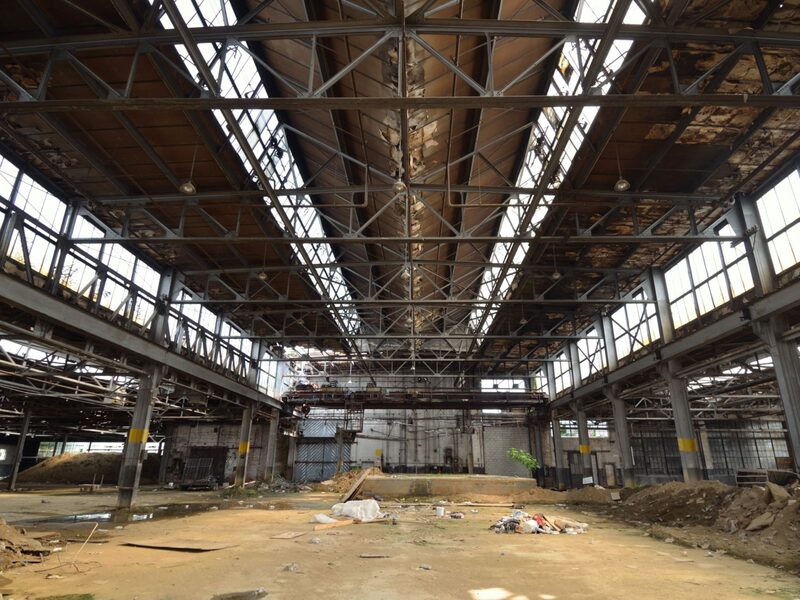 Together, the two companies are planning a massive redevelopment of abandoned Roebling Factory buildings, the same ones on the corner of Hamilton and 129 that suffered so much neglect. Trenton needs someone to take action. Almost a third of the city’s population lives under the poverty line and each city street is pockmarked with boarded up buildings. The difference between the quality of life in Trenton and in nearby suburbs is astounding – the Trenton Metro area, a region that includes Princeton and other wealthy Mercer County suburbs, is the second most economically segregated metropolitan region in the United States. There’s massive separation between the low-paid, service industry jobs available in Trenton and the highly paid intellectual or creative work outside the city. This disparity in economic opportunity has a profound effect on other aspects Trenton life. Take education – the Trenton Metro area has the 6th largest gap between the number of college graduates and those who never completed high school in the country. Hatch, his husband, and a few other neighbors formed a company and developed 20 vacant properties in the area, keeping as much of the history as possible alive in the buildings. Metal lampposts line the cobblestone sidewalks of Mill Hill, highlighting colorful single-family houses with well-kept yards and flower boxes. There are few of the boarded-up buildings so pervasive on other Trenton streets. Now, many projects later, Hatch has a vision for the Roebling Factory. After ridding the space of industrial contamination and debris with the support of the local and national government, HHG Development will turn one of the factory buildings into approximately 135 loft apartments and another section of the complex into commercial spaces. In the future, they also hope to convert the rest of the abandoned buildings into more lofts or commercial, retail, and office space. Roebling Block 3 is not at all the only development project in Trenton. On the southern edge of HHG’s project lies a shopping center, a project run by a different development company. The brick of the buildings, the small gridded windows, and the steel trusses recall the space’s previous industrial structures, but the development is clearly new and not at all dilapidated. The parking lot is full and Trenton residents shop at the various stores, ranging from a supermarket to a miscellaneous retail store selling discount basketballs on the wide sidewalk in front of its doorway. The development also houses a few family support organizations around the corner from the stores; across the parking lot are a children’s playground and a long building of affordable apartments. What makes HHG’s Roebling Block 3 different from its next-door neighbors, though, is its focus on bringing new residents to Trenton. The typical one-bedroom apartment in the development might cost $1,100 per month, a price that’s high in Trenton but cheap in comparison to New Jersey suburbs. That price could rise if demand increases – the apartment prices are not capped for low or middle-income groups. HHG plans the development with that new audience in mind, even naming the commercial building in the complex “Creative Class Commercial.” Uses could range from offices for high-tech companies to woodworking or furniture building, light industries with an arts focus. The project’s ultimate goal: to re-energize Trenton, drawing talent away from suburbs and back into cities. Imagining a “creative class” artisan bakery moving in across the street from family planning nonprofits brings to mind a concern about Roebling Block 3: the threat of eventual gentrification, or the idea that a wealthy group might move into Roebling factory, slowly raise housing prices in the surrounding areas, and make at least a section of Trenton unaffordable for the people who currently live there. Hatch already considered that possibility. He feels that in the very specific case of Trenton, housing directed at a higher income bracket would actually make a positive difference. Unlike most areas with booming real estate prices, Trenton has plenty of public housing projects and developments designated for low-income groups, but those projects are not balanced out with “market-rate housing” – real estate in which the price is defined by demand, a kind of housing that is generally more expensive. That second factor is particularly harmful to Trenton. After de-industrialization, one of the only major employers left in Trenton was the State of New Jersey. The number of state buildings, nonprofits, and low-income housing projects dwarfs that of privately owned properties, meaning that, in terms of property tax, the state has virtually no money coming in. Roebling Block 3 might be a step towards fixing that. By mid-October some of Mill Hill’s homes have pumpkins and Halloween decorations by their front doors. A blue sign announces the community watch system in the neighborhood – it says, “Mill Hill: we look out for each other.” A man covering his grill in his backyard said he hadn’t heard of the project, but that he would likely support it. “We need the tax revenue, just like any city,” he explained. Some academics also support Hatch’s approach. Barry Hersh, a real estate expert at New York University, feels that a market-rate solution is essential in fixing the current, segregated character of Trenton. But the Roebling development has also raised questions. Dr. Aaron Shkuda, an urban planning historian at Princeton University, explains that Hatch’s approach is a common one, but that there’s plenty of skepticism in the urban-studies community as to whether such development has an overall positive impact on cities. Anderson enunciates passionately as he speaks over the phone; his deep voice capitalizes on the emotional power of words like “segregation” and “integration.” Anderson has emphasized the importance of race in the question of city development throughout his career: his first book, A Place on the Street Corner, was an ethnographic study of a corner bar on the Southside of Chicago; his most recent, The Cosmopolitan Canopy, is a study of the spaces in Philadelphia where races interact civilly, despite the hostile context of race in America. Anderson’s concerns about race relate directly to the situation in Trenton. As of the 2010 census, the city is 52% African American, almost 35% Latino, and only 27% Caucasian. The neighborhood directly around Roebling Block 3 is made up of small row houses that used to be the working class homes of wire factory employees. The neighborhood was once almost exclusively filled with Italian immigrants – it was one of the best spots to scope the authentic Italian restaurants in Jersey – until a few decades ago, when all these original white residents moved out of the city. Now, after a large wave of Central American immigration into Trenton, it’s much easier to find great Guatemalan food than Italian fare, and every storefront sign is in Spanish, not English. “Going back to the space that you’re talking about – it really encourages white people, almost by definition,” Anderson told me after hearing about how the site is designed for the creative class. In his own research, he’s seen this kind of “white space” before, referencing an artisan brewery he recently studied in Philadelphia. “There are plenty of black people who are very cosmopolitan and who are middle class and who don’t even notice any problem. They can pay the price, they’re middle class, and they’re used to paying eight bucks for a Heineken.” Anderson paused with a slight chuckle, but then soberly continued to explain how the community – the Hispanic immigrant residents living directly around the Roebling project and the underprivileged, minority residents of Trenton more generally – might feel in this creative class space. Of course, neither the management of the brewery nor HHG are segregationists. A community perceives Anderson’s “white space”; developers do not necessarily design with that in mind. Small actions on the part of developer and business owner are what foster a sense of unease amongst marginalized groups. Part of what made the Philadelphia brewery a “white space” was that, despite being in a very diverse area, the company only hired two black employees. Such a detail suggests to minority residents that people of color might not be welcome. When a marginalized African American or Latino community feels that a space is not for them, that it’s for a whiter, wealthier class – that’s when an area becomes a “white space” and the more intangible negative effects of gentrification hit. Roebling Block 3 is still in its early development stages – it’s filled with industrial contamination and has a full-grown tree peaking through one of its broken windowpanes. No urban planner has found a foolproof way to take this kind of decaying building in a struggling city and develop inclusively, investing without making clear moves towards gentrification. Hopefully, as Hatch projects, Roebling Block 3 will connect with Trenton’s marginalized community and improve quality of life for all residents. But the poverty we see today is structural. It’s the result of a shift from manufacturing to service and technology in the globally expanding economy, and that kind of poverty may be significantly more intractable than Hatch would like to believe. The soul, the story of Trenton lies in the bricks of Roebling Block 3 buildings: the industrial boom, the decline, the stubborn resilience. Now, maybe, the gentrification. Anderson would claim it’s also a story of global inequality, of volatile race relations and persistent segregation.